The JFACC’s role is to plan joint air operations. In doing so, the JFACC provides focus and guidance to the JAOC staff. The amount of direct involvement depends on the time available, preferences, and the experience and accessibility of the staff. The JFACC uses the entire staff during planning to explore the full range of adversary and friendly COAs and to analyze and compare friendly air capabilities with the adversary threat. The JFACC must ensure that planning occurs in a collaborative manner with other components. Joint air planners should meet on a regular basis with the JFC’s planners and with planners from other joint force components to integrate operations across the joint force. Planning is a continuous process and only ends with mission accomplishment. The JFC’s estimate of the operational environment and articulation of the objectives needed to accomplish the mission form the basis for determining components’ objectives. The JFACC uses the JFC’s mission, commander’s estimate and objectives, commander’s intent, CONOPS, and the components’ objectives to develop a course of action (COA). When the JFC approves the JFACC’s COA, it becomes the basis for more detailed joint air operations planning—expressing what, where, and how joint air operations will affect the adversary or current situation. The joint air estimate is described as a process of reasoning by which the air component commander considers all the circumstances affecting the military situation and decides on a COA to be taken to accomplish the mission. The joint air estimate reflects the JFACC’s analysis of the various COAs that may be used to accomplish the assigned mission(s) and contains the recommendation for the best COA. See pp. 6-3 to 6-4 in AFOPS2. The JFACC is responsible for planning joint air operations and uses the joint operation planning process for air (JOPPA) to develop a JAOP that guides employment of the air capabilities and forces made available to accomplish missions assigned by the JFC. JOPPA follows the joint operation planning process found in Joint Publication 5-0, Joint Operation Planning, with specific details for joint air operations. JOPPA drives the production of the JAOP and supporting plans and orders. See pp. 6-5 to 6-18 in AFOPS2. Click here for related SMARTnews article on the Joint Operation Planning Process for Air (JOPPA). 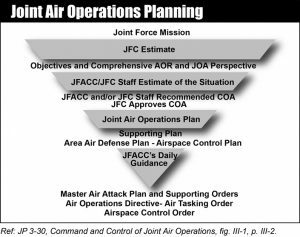 The JAOP is the JFACC’s plan for integrating and coordinating joint air operations and encompasses air capabilities and forces supported by, and in support of, other joint force components. The JFACC’s planners must anticipate the need to make changes to plans (e.g., sequels or branches) in a dynamic and time-constrained environment. Planners should include representatives from all components providing air capabilities or forces to enable their effective integration. See pp. 6-16 to 6-18 for a sample joint air operations plan (JAOP) format in AFOPS2. The JFC will normally delegate the authority to conduct execution planning, coordination, and deconfliction associated with joint air targeting to the JFACC and will ensure that this process is a joint effort. Targets scheduled for attack by component air capabilities and forces should be included on an ATO for deconfliction and coordination. See pp. 6-19 to 6-22 in AFOPS2. The joint air tasking cycle process provides an iterative, cyclic process for the planning, apportionment, allocation, coordination, and tasking of joint air missions and sorties within the guidance of the JFC. The joint air tasking cycle is synchronized with the JFC’s battle rhythm. The full joint air tasking cycle, from JFC guidance to the start of ATO execution, is dependent on the JFC’s and JFACC’s procedures. The precise timeframes should be specified in the JFC’s operation plan or the JFACC’s JAOP. See pp. 6-23 to 6-28 in AFOPS2. 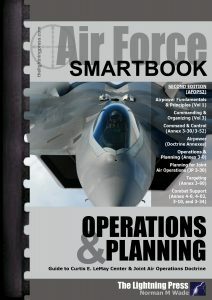 This article is an extract from “AFOPS2: The Air Force Operations & Planning SMARTbook, 2nd Ed. (Guide to Curtis E. LeMay Center & Joint Air Operations Doctrine)” by The Lightning Press. Download a free PDF sample and learn more at: AFOPS2: The Air Force Operations & Planning SMARTbook, 2nd Ed. (Guide to Curtis E. LeMay Center & Joint Air Operations Doctrine).